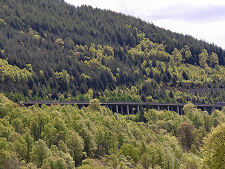 Today the railway line from Perth to Inverness continues to travel through the Pass of Killiecrankie, though since the 1970s the main road, the A9, has been moved to a new route much higher up the east flank of the glen, well above the pass itself. 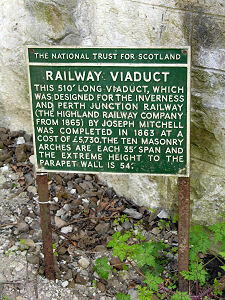 The road it replaced remains, however, and provides a much more scenic route from Blair Atholl down through the village of Killiecrankie, and then through the pass itself, en route to Pitlochry. 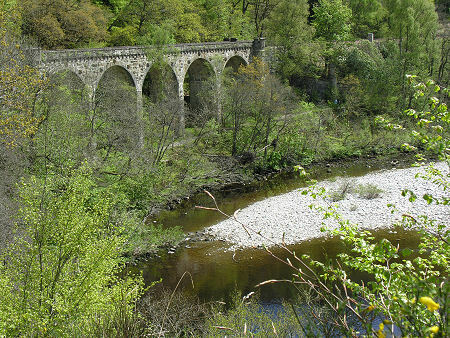 If you do take this older road, look out for the National Trust for Scotland's Killiecrankie Visitor Centre a little to the south of the actual village of Killiecrankie itself. 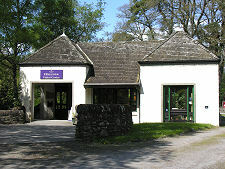 The visitor centre is well worth a stop in its own right as it gives a fascinating insight into the background of the Pass of Killiecrankie and the wider area. 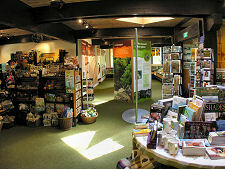 It also has a well stocked shop. 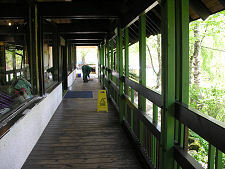 But the main reason to stop at the Killiecrankie Visitor Centre is to enjoy a very striking chunk of Scottish scenery, and to understand the part that this place played in an important episode in Scottish history. 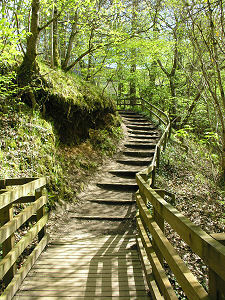 It is probably best to say up front that the paths that descend from the visitor centre into the lower reaches of the pass are steep in places, are mainly of compacted earth, and many sections have steps. This is a place you are most likely to enjoy in sensible shoes. 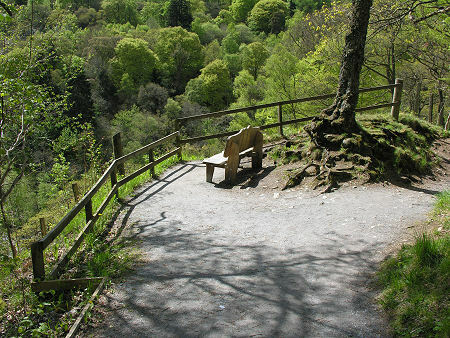 Some people come to Killiecrankie for the ever changing face of Scotland as it progresses through the seasons. 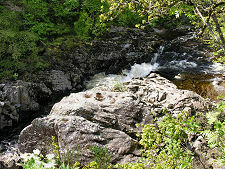 The pass has been designated a Site of Special Scientific Interest and the steep paths and deep glen allow you many different perspectives on the river, the glen itself and the surrounding trees. These always seem to have been a feature of the pass, whose name is Gaelic for "wood of the aspen trees". On a quiet day this is a great place to enjoy the wide variety of birdlife found here, or to try to spot the native red squirrels or, if you are really lucky, the reclusive otters which live around the river. One animal you won't see is the wolf: the last wolf in Perthshire was killed in the Pass of Killiecrankie in 1680 by Sir Ewen Cameron of Locheil. 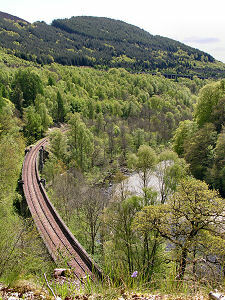 Throughout history, the Pass of Killiecrankie was travelled by most overland visitors to the Highlands. It is interesting to consider that our own response to it, as a place of beauty, is a relatively recent development. 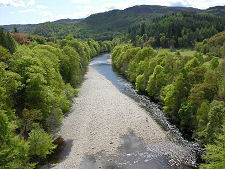 Thomas Pennant, in writing about his tour of Scotland in 1769 said of Killiecrankie: The pass is extremely narrow between high mountains, with the Garry running beneath in a deep dark foam, and a rocky channel, overhung by trees, forming a scene of horrible grandeur." 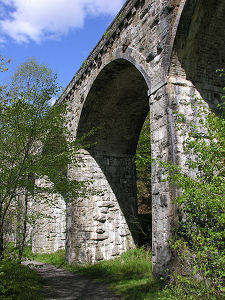 In 1844, Queen Victoria took a very different view when writing in her journal: We came to the Pass of Killiecrankie, which is quite magnificent: the road winds along it, and you look down a great height, all wooded on both sides, the Garry rolling below it. I cannot describe how beautiful it is. Albert was in perfect ecstasies." The pass was probably not a welcome sight to another group of visitors who travelled through it on 27 July 1689: 4,000 government troops on their way to defeat at the hands of the Jacobites in the Battle of Killiecrankie. The background to the battle was the "Glorious Revolution" in which James VII of Scotland and II of England was ousted by William of Orange and his wife Mary, who was James' daughter. On 22 January 1689 an English Convention Parliament declared William and Mary to be rightful joint monarchs of England, and on 4 April 1689 a Scottish Convention met to consider how to proceed north of the border. The debate was a close one, and it is entirely possible that the Scots may have concluded by declaring that James VII remained the rightful king of Scotland. However, the well established Stuart trait of doing exactly the wrong thing at the wrong time came to the fore again, and when an arrogant and threatening letter James had written to the Scottish Convention was considered alongside a courteous and reasoned letter from William, it fatally undermined James' support. As a result William and Mary were declared joint monarchs of Scotland. The outcome in Scotland was an immediate uprising among James' supporters, who became known as Jacobites. This was led by the charismatic John Graham of Claverhouse, 1st Viscount Dundee who raised an army among the highland clans and established his headquarters at Blair Castle. The response of the new government was to send an army north led by General Hugh Mackay of Scourie. On the morning of 27 July 1689, Mackay's force of 3,000 infantrymen and 1,000 cavalry made their way along the rough track through the Pass of Killiecrankie. Many were inexperienced, and it is doubtful that any of them would have regarded their surroundings as beautiful. As they approached the northern end of the pass, the first shot of the battle was fired when a cavalry officer was killed by a Jacobite sniper positioned on the far side of the river. 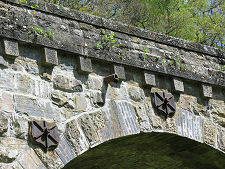 The site is today known as Trooper's Den and is where the railway viaduct now stands. 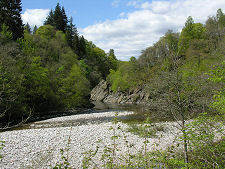 The government troops emerged from the north end of the pass and then moved along the steadily widening glen which at this point goes north west towards the Jacobite headquarters at Blair Castle. The 1st Viscount Dundee had been well aware of the approaching government troops, but only had 2,500 men, including very few cavalry. Reinforcements were on the way, but would not arrive in time to prevent the government side capturing Blair Castle. Dundee therefore formed his troops up along the higher slopes of the north east side of the glen above the area now occupied by Urrard House. 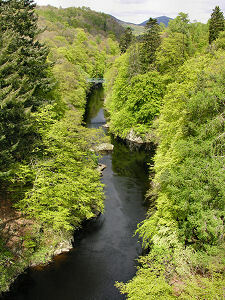 The government troops took up positions lower down the same slopes, with their backs to the River Garry. For two hours the two armies just stood and looked at each other, while Mackay's three cannons proved totally ineffective trying to fire up the side of the glen. At about 7pm the sun sank over the hills to the west and, with the sun no longer in the eyes of his men, Dundee gave the order to charge. It is said that 800 Jacobite Highlanders were killed by the gunfire of the government troops during their charge down the hillside. When they closed, the clansmen each fired a single shot with their musket before discarding it in favour of their broadsword and targe (shield) and engaging the Government troops, many of whom were still struggling to fix bayonets on the end of their muskets. The result was carnage, as many of the inexperienced troops tried to flee, only to find their retreat cut off by the river. Mackay and some of his troops managed to ford the river a little way upstream of the battle before retreating west. 2,000 of his men were not so lucky, and died during the battle itself or in the pursuit that followed it. One who could count himself exceptionally lucky was a redcoat called Donald McBane. He fled back into the pass with a number of clansmen in close pursuit. 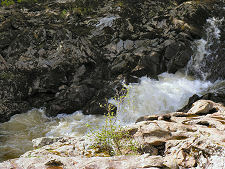 He escaped by jumping across the river between two rocks with a cataract running between them. 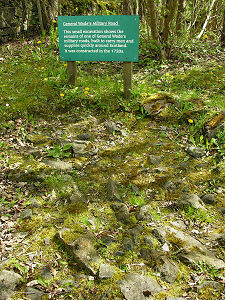 The gap he cleared has since been measured as 18ft or 5.5m wide, and to this day the spot is known as Soldier's Leap. The Jacobites won the day, but among their casualties was Viscount Dundee, mortally wounded by a musket ball during the initial downhill charge. 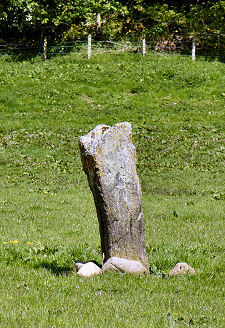 A short distance north of the village of Killiecrankie there is a standing stone in a field still visible from the road. This is known as Claverhouse's Stone, and tradition relates that the wounded John Graham of Claverhouse, 1st Viscount Dundee, was sitting against it when he died. He was buried three days later in the vault underneath St Bride's Kirk in the grounds of Blair Castle. Without Dundee in charge, the 1689 Jacobite uprising rapidly failed: though it was only the first of a series that would cause conflict across Scotland and beyond until the Jacobites' final defeat at the Battle of Culloden in 1746. Today this bloody episode adds a certain atmosphere and a different dimension of interest to a visit to the Pass of Killiecrankie. And possibly more. There are stories of carriages traversing the road through the pass in the 1800s (and cars in the 1900s) being pursued by ghostly forms; of a red glow appearing over the site of the battlefield; and of some visitors actually seeing the dead still lying where they fell, over three centuries ago.